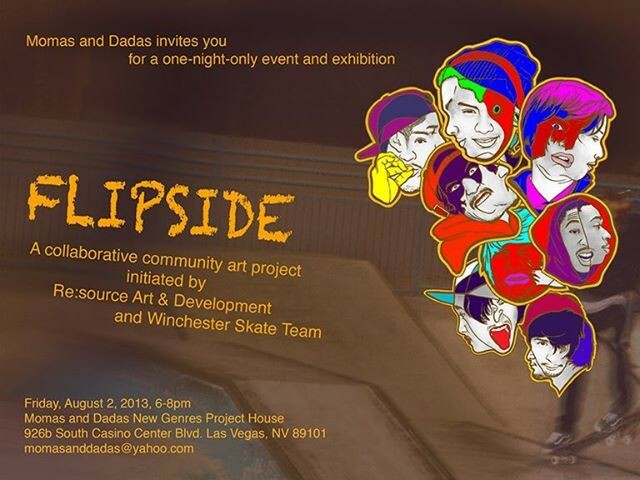 FLIPSIDE, a one-night-only event and exhibition in collaboration with the Re:source Art and Development, created by artist Jevijoe Vitug. FLIPSIDE investigates the wonder of the other side. The term, coined for the B side of wax records and cassette tapes, relates to physical action necessary to acquire new information. Having been a resident artist in the intense Las Vegas heat for over 4 weeks, Jevijoe Vitug recontextualizes the term and refers to the interior and exterior architecture of Momas and Dadas Project House, as side A and side B. Aside from his studio work inside the project house, the artist uses the outdoor area as an open art space in collaboration with non-profit groups and communities. For this event, various activities will happen within the block of Momas and Dadas New Genres Project House. a. Wheat paste paintings entitled “Flipside portraits”. Made of recycled foamboard, neon paint, paper and wheat paste, the paintings portray young people “flipping” various facial expressions. This includes portraits of young skateboarders from the Winchester Skate Team, in which Vitug has conducted an art workshop. b. Temporary sculpture at the park – Prop from a previous window display will be reused and transformed into a contemporary sculpture. c. Temporary skateboard alley – The Winchester Skate Team will design a DIY ramp and rail in the back alley space. d. Installation art entitled “Looking Suspicious”, Jevijoe uses a vacant space in between the houses as an installation site in response to violence against youth. Re:source Art and Development is an art initiative dedicated to the archiving, collaboration, research and development of locally based resources. Using the transformative potential of art as a bridge between available resources and immediate communities in need and helping them achieve their various advocacy.